However, if you have the time, continue reading to find out why this book is a must-have for anyone with even a passing interest in web design. While web design is a creative process, reading about it can be very dry, and, let’s be honest, sometimes boring. Jeremy Osborn and Jennifer Smith combat those problems by breaking up the book into 12 easy-to-follow lessons, complete with screenshots and a review section at the end of each chapter. In addition to reading about web design, the authors created a web site with 12 video tutorials to accompany the text. I highly recommend watching each video before reading the chapter. The video shows some, but not all, of the concepts discussed in the chapter. Plus, if you’re a visual learner as I am, the videos help make sense of more complex topics. The best way to really understand the information presented in Web Design with HTML and CSS Digital Classroom is to write the code in your own text editor. Osborn and Smith give plenty of text editor choices, paid and free, for both Mac and Windows users. Lesson files are available for download from their web site; the reader can then open these files in a text editor and add code as per the lesson. I find doing the exercises, combined with watching the videos, rather than just reading, makes learning about web design much easier and much more interesting. Lesson 1: Planning Your Web Site.. There’s more to a web site than just writing code. What is the goal of the site, who are the end users? Lesson 2: Fundamentals of the Web. Learn about domain names and hosting services, designing for the web, how web pages work. Lesson 3: Web Design Tools. Here the authors introduce readers to text editors like Adobe Dreamweaver, Text Wrangler, and TextEdit. Lesson 4: Fundamentals of HTML, XHTML, and CSS. At this point readers learn about HTML structure, images, CSS, and style sheets. Lesson 5: Graphics, Color, and Transparency. Adobe Photoshop was used for the examples in this chapter. I used Adobe Photoshop Elements; it doesn’t have all the bells and whistles of Photoshop, but had enough that I was able to understand how to adjust photos and images for web use. This chapter alone makes the book worthwhile. Lesson 6: Formatting Text with CSS. Now that the reader has learned how to structure a page with HTML, it’s time to learn how to control the appearance of the page with CSS. Lesson 7: Introduction to CSS Layout. The authors broach intermediate concepts of CSS: float, div, clear, margins, and padding. Lesson 8: Advanced CSS Layout. Are you familiar with absolute positioning? Internal versus external style sheets? Background images? You will be at the end of this chapter. Lesson 9: Browser Compatibility. Just because your web site renders correctly on your MacBook Pro using Safari doesn’t mean that it will render correctly on other browsers or operating systems. This chapter explains why browser testing is important, how to test a browser, and how to address browser incompatibilities with CSS fixes. Lesson 11: Mobile Design. With so many people using smart phones, many web sites need to be redesigned for mobile optimization. Lesson 12: HTML5 Essentials. What is HTML5, and how it’s different from what we currently are using. As I said at the start of this review, I love this book. It’s as if the authors are holding your hand every step of the way, yet giving you space to learn on your own. 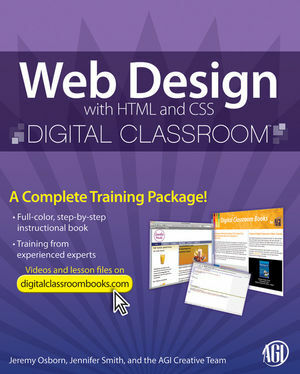 Web Design with HTML and CSS Digital Classroom shouldn’t be the only web design book in your library; no one book can cover all you need to know. But if you’re new to web design, or need a refresher course, I strongly suggest Web Design with HTML and CSS Digital Classroom as an excellent start.